AMY GOODMAN: Harry, I have a quick question, talking about the children and talking about Dr. King in Birmingham. Coretta Scott King recently died, and it was quite a remarkable funeral. Over 10,000, 15,000 people came out, four presidents, many senators. Reverend Joseph Lowery, while President Bush was sitting right on the dais, talked about weapons of misdirection right here, and President Carter talked about Dr. Martin Luther King and Coretta Scott King being spied on, and Maya Angelou stood up and said, "I speak here for Harry Belafonte and others." Did you try to go to Coretta Scott King's funeral? HARRY BELAFONTE: What had happened was that when Dr. King came on one of his very first trips to New York, he was in Harlem, and a deranged black woman stabbed him, and he was -- the blade was just millimeters away from his heart, and to remove the instrument, his life was in jeopardy, and it was a very delicate operation. And it was then that I understood that -- after seeing Dr. King and talking to him, his first concern was what would happen to his family. And I said to myself, our leader cannot be concerned about that. That burden should not be on his shoulders. There are other aspects of the burden that would be his in relation to it, but not that. So that it was demanded and responded to that forever the welfare of his family would never be in jeopardy with him being at the helm of the movement, and we brought resources, and it was my task to direct all that, watching the kids grow, put money aside for their studies, to take care of Coretta, to make sure she had every convenience at her disposal to go, come while her husband was incarcerated. So the intimacy of that experience was something that I had become accustomed to, and when Dr. King was murdered, I was in Atlanta in their home, and we separated ourselves from others who were there in the living room, and she said, "Would you come with me." We went into the bedroom, and she said, "Help me select the clothes that I must -- we must dress him in." And it was a very private and a very remarkable thing to - the intimacy of it with her. And as we were selecting the suits and the shirt and the tie and laying it out, she sat on the bed, and she kind of - a place where she had slept so often with her husband, and all those memories. And I said, "What is it?" She says, "You know, I'm worried about where this is all going. I'm worried about the nation, the rage, the anger, and I need to know what to do." And we talked for a second. Then I said to her, "You know, at this very moment in Memphis, thousands of sanitation workers are on hold, because Dr. King was supposed to have been there tomorrow to lead that movement and to speak to the people, and before your husband, our leader, is put in his grave, if you have the will and the capacity to go down there tomorrow and stand up before those workers and let the world know that the movement has not been interrupted, that the process continues, and that all of us, as strong or as weak as we may be, will step into the breach and do what must be done." And she did, and she went down, and she spoke, and we came right back. Now, all through the years since then, the building of the King Center, many choices of things that she made to do, because she was in her own right very involved for Dr. King. She was one of the - she was very, very committed to the peace movement, and as a matter of fact, in Europe, during the assassin-- the missile crisis and whatnot, we gave -- we put on a peace concert for 250,000 Germans in Cologne, mostly students, and the moment when Coretta King -- I called and asked her to come to speak. It would mean a lot to the young people there. She came, and I have never, ever heard a declaration of approval like those young German youth did when she came, and she had a sense of her own power. She had a sense of her own capacity to bring influence and to be revered for the work she did. When she died, none of us knew that she was in Mexico, that she had -- I knew that she was ill. I knew about the heart attack, the defibrillation and the stroke. But - and I knew she had cancer, but I thought the cancer was contained, and when she went to Mexico, she was there with her children, and I got the news completely without knowing any of the details, so for a few days we didn't know what was happening. Where is she? Who's bringing her home? When is the funeral? When is the this, when is the that? And finally, I left a call -- I left a message on the phones of the children, saying, "Please give me a call. I know this is a difficult moment, but there are things that must be done, and I would like to help if I can." I was then called a day later and told that, yes, that it was on that Tues-- this was on a Friday, Friday evening, that the funeral was going to take place that Tuesday, and that it would start at noon, and that with all the people that were being invited, that it was -- I was to be one of these people delivering the eulogy, and that my time would be at somewhere around 12:30 or 1:00, and I said, "Fine." And knowing this, I began to put my thoughts together. That Saturday, Bush declared he was coming. He would be there. That Sunday, I began to change my speech, not to be rude or to be attacking, but to integrate this moment into what needed to be said. And then, that Monday morning, I got a call, and I was told that the invitation that had been extended to me had been pulled. I was uninvited. A woman by the name of Skinner and a Reverend by the name of Lawrence was the one who called me to tell me that I was uninvited, and when that call came, I called and spoke to one of the children. They said, these are the events, and I need to be counseled as to how this has come about, and I was told that I would get a call shortly, and it would all be clarified. And then, when the final call came, it was -- they were sorry, but the invitation - the withdrawing of the invitation would stand and that if I came down, they would find a place for me in the church, but I would not speak. And I did not go at all. I did not know how to deal with that. What struck me was on the day of the ceremony, I saw how the altar was adorned. I saw who sat there, and as the camera moved about, I saw who was sitting in the audience, and I saw all of the power of the oppressor represented on the stage, and all those who fought for the victories that this nation was experiencing and enjoying sat in the outhouse, sat out in the field, sat removed, and if it not been for Lowery, for President Carter and for Maya Angelou, we would have had no voice and no representation at all. Some ministers who were quite angry at all of this said, "Come on down here. Let's -- let's -- We have to talk to the press," and I said, "Talk to the press about what?" "About this. We cannot let it stand." I said, "I don't think that's appropriate. These are the children of my friend. These are the children of the movement. Where did we let them get caught? Why was Bernice giving this kind of sermon? How did you let Reverend Long become the minister of choice? Why wasn't it at Ebenezer Baptist Church, where Dr. King preached? And before we go public and begin to vent our anger, let us understand what role we played in this capitulation that has led to this moment, and let us try first to repair it rather than to go into public discourse. When do we sit in a circle of healing? When we begin to talk about getting back to where we lost stride. How do we fix this? Not how do we play the vanity game, and get off on going public and talking about how I was crucified. You know, it's what it is, and there is a way in which we have to do this that not only prevents - I don't know that there'll be another moment quite like that, because Dr. King and Malcolm X and Fannie Lou Hamer, folks like that were so rare that to be a part of the final ceremony of their departure is a rare moment in history, but I think that it goes along with what I have been saying here. What role have we played in letting all this happen? Where were we? What were we doing that had us so distracted? How can it be this way? How did you priests and ministers let the evangelical rightwing Christian forces co-opt the greater truth about Christianity and the philosophy of liberation? And how did you all let that happen, and where are your voices in opposition publicly? Everybody has a part in this. Everybody has something to look at, and I think it is a collective experience, and that's why I think rather than sitting here drifting, we've got to talk about this, not just where we failed and where you failed, and we've got to come out of this discourse and this discussion, not just talking about it but saying, "Here's where we go," and take courage in the fact that we can turn this around, because the truth of the matter is we are the only ones that can turn this around. Nothing and no one else can do it. Nothing. 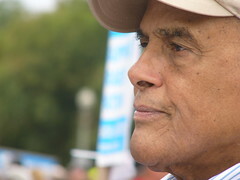 AMY GOODMAN: Harry Belafonte, describing his dis-invitation from giving a eulogy at the funeral of Coretta Scott King.